Will 3-D Printing Revolutionize Sports Medicine? Buttercup the duck was born with a backward foot and never knew what it felt like to walk normally — that is, until 3-D printers came along. Over the summer, Buttercup was fitted with a customized silicone foot from 3-D printing company NovaCopy. They copied the foot shape and size of Buttercup’s sister and found that the little guy actually got along quite well with his new foot. This story is exciting because 3-D printing technology is poised to make huge ripples in human science — and sports medicine — in the very near future. Buttercup the duck from the Feathered Angels Waterfowl Sanctuary is getting around with a 3-D printed foot. How long before humans can enjoy the same medical miracles? “A 3D printer is like a regular printer, except that it makes a solid object you can hold in your hand,” explains Sabeen Admani, a bio-medical engineer at the Jump Trading Center in Peoria, Illinois. She adds that the 3D printer gets its instructions from a computer and can then perform feats like recreating a digital medical CAT scan. Sports Grid recently detailed a new device called a Bio-Pen that works much like a 3-D printer — except that it’s a pen that can “draw with living cells” and “deposit stem cells precisely onto damaged bone and cartilage to speed the healing process.” Essentially, says Dezeen Magazine, the device takes cellular material and releases it from a nozzle, along with protective gel, and deposits it in dense layers. A polymer layer can be added to give the structure more support, while cell-stimulating drugs can be added to stimulate healing. What Can 3-D Printers Do for Sports Medicine? In 2012, a team at Glasgow’s Caledonian University began using 3-D printers to create foot and ankle support structures, including casts, splints, and personalized insoles. However, the technology is advancing in leaps and bounds as researchers experiment with materials that may one day aid more invasive procedures — like orthopedic surgery. The prospect is that this type of advanced treatment may be used to reduce surgical times, allow doctors to physically hold an exact replica of the body part they’ll be operating on, help people recover from acute bone and cartilage damage, and create quick ready-made prostheses. The hope for 3-D printing technology is that we will one day be able to create human body components for implantation to heal injuries and correct deformities. – A group of Wisconsin researchers presenting at the American Academy of Orthopaedic Surgeons Annual Meeting revealed how cheap and efficient plastic models of human anatomy could be, using 3-D printing. For less than $100, they created a custom shoulder blade using the Osirix app and a CT scan by a company specializing in 3-D printing. Feasibly, the surgeon could use this model in pre-surgical planning or create a negative mold of an implant to decide how to shape bone grafts during surgery. 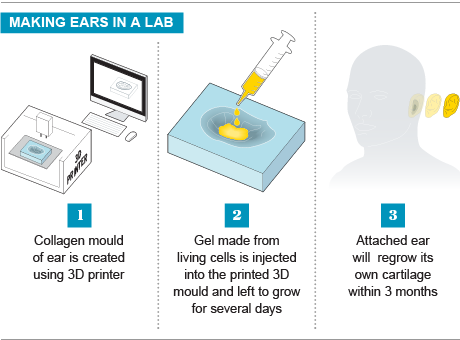 – Researchers from Wake Forest Institute for Regenerative Medicine say they have created artificial cartilage from a 3-D printer that is stronger and more durable than current products on the market. Engineering cartilage from pluripotent stem cells may even encourage the body to naturally replicate the cartilage on its own, scientists say. – Washington State University scientists are creating bioceramic composites and custom titanium implants that can bear the load of the human body if need be. To be clear, we’re still a long ways off from implanting custom 3-D printed bones into people’s bodies, but the technology is there — and that is very exciting! We’ll be keeping a close eye on the real world applications of 3-D printers in the field of sports medicine, so we can continue offering you the very best medical science has to offer.